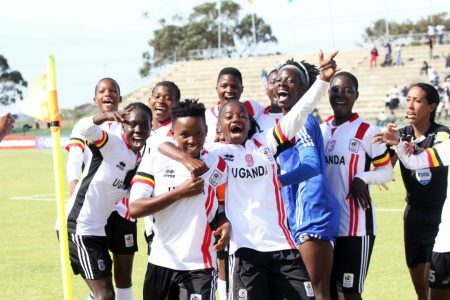 PORT ELIZABETH – The Uganda Crested Cranes survived a late scare to defeat Zimbabwe 2-1 in their final group game at the ongoing CECAFA Women’s championships. Captain Tracy Akiror and substitute Juliet Nalukenge who both play for Kawempe Moslem FC scored the Cranes’ goals in the second half following a barren first 45. Zimbabwe who won their last COSAFA title in 2011, ensured a nervy ending by scoring late through Lutendo Mukore but Bulega’s team held on for a famous victory. Before the games, Bulega made one change to the team that drew 0-0 with Namibia on Saturday with Phiona Nabbumba replacing Hasifa Nassuuna. Both sides started slowly with limited goal scoring chances in the first half as most i the action happened in the middle of the pitch. Upon restart, Bulega called for the first substitution with Shamira Nalujja paving way for Nassuna as Uganda took the initiative. Another substitute Nalukenge who had earlier come on for Resty Nanziri in the 55th minute broke the deadlock with on 73 minutes, poking home a Lilian Mutuuzo excellently weighted ball. Captain Akiror doubled Uganda’s lead in the 78th minute heading in a Nassuuna well taken corner kick. Zimbabwe got their consolation on the 90th minute via a direct corner kick by Lutendo Mukorwe but the Crested Cranes held on to take all three points. After the game, Crested Cranes’ head coach Faridah Bulega said her side was ready to face any team that comes their way. “It was a very tough game like we anticipated it would be. Said Bulega. “We have managed to full fill one of our main objectives and that is getting out of the group. “Now that we are in the knock-out stages, we are ready to take on anyone who comes our way. Shadia Nankya was voted as the player of the match. The Cranes finished top of Group C with seven points, one ahead of Zimbabwe who finished second. Zimbabwe will have to wait for results in the other groups to see whether they join Uganda in the semi finals.